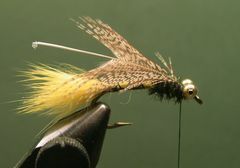 The SEM Damsel works great when you notice Damsel Flies on your favorite lake or pond. Thorax Peacock Herl Three to four herls. The rabbit fur for the tail and the abdomen comes from a Zonker Strip. Use small or ex-small bead chain eyes. I use Haretron Dubbin for the head because I like it better than other dubbing material, but any dubbing, at hand, should work. Tie the SEM Damsel to your tippet with an open loop knot to give it maximum action in the water. If you're not familiar with fixed loop knots click on the "Warmwater Knots" page. Fish the SEM Damsel in the weeds and along weed lines where Damsel Fly nymphs are found. 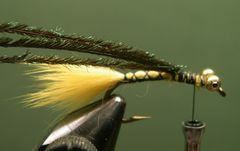 Fish the fly with short strips and pauses at different levels in the water column until you locate fish. Bend the hook to this shape with your pliers before you clamp it in the vice. Doing this helps the fly to ride hook-point up. Clamp the hook in the vice and crimp the barb. Start the thread behind the hook's eye and lay down a base of thread back to the hook's bend. Attach the bead chain eyes slightly behind the hook's eye with several figure-eight wraps. Some super glue on the thread will help lock the eyes in place. Cut a clump of rabbit fur from a Zonker Strip for the tail and abdomen. Cut the fur as close to the hide as possible. With the butts of the fur clump against the eyes, make spiral wraps back to the bend and return with overlaping spirals of thread to the eyes. Wrap the thread back to about the two-thirds point on the hook's shank and tie in three or four peacock herls. Clip the tips of the herls before you tie them in. Move the thread to the base of the bead chain eyes. 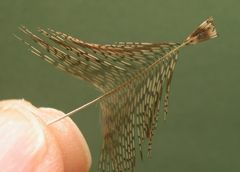 Make a herl rope by grasping the ends of the peacock herl with your hackle pliers and twist them into a rope like strand of peacock herl. 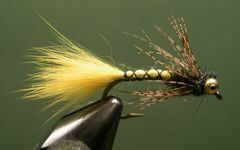 Wrap the herl rope forward to the base of the eyes and tie it off with several wraps of thread. Trim the excess herl. 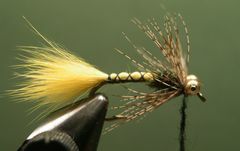 Select and prepare a partridge feather to tie in for the legs. Notice the tip that will be tied in. Tie the Partridge feather in by the tip, at the base of the eyes, with the cupped side of the feather facing the hook. 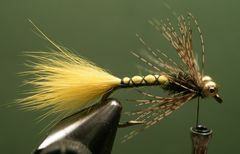 Make two or three wraps of the feather to form the legs and tie it off. Remove the excess feather. Apply a thin noodle of dubbing material to the thread. Figure-eight wrap the dubbed thread around the eyes until you achieve a dubbed head that appears around the eyes. Tie off the tying thread in front of the eyes with a couple of half-hitches or a whip finish and your Carter's SEM Damsel is finished.